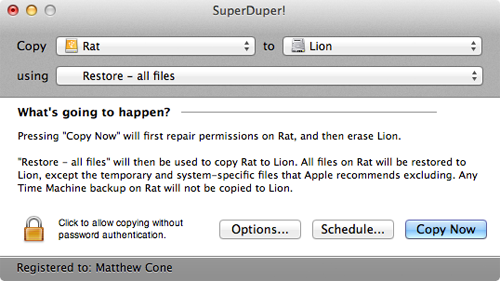 You made backups with a third-party application called SuperDuper!. Now maybe the time has come to transfer your backup onto another hard drive. Maybe the unthinkable happened and your primary hard drive failed. Or maybe you just replaced your primary hard drive with a new, larger drive. Whatever the case, you need restore from your SuperDuper! backup. Note: You cannot restore the backup to the current startup disk. Select the backup disk from the Copy menu. From the To menu, select the hard disk you want to restore the backup to. From the Using menu, select Restore - all files. Click Copy Now. SuperDuper! starts restoring your backup to the selected hard drive. Depending on the size of your hard drive, this can take a couple of hours. You can continue using your computer while SuperDuper! is restoring the hard drive.